Sitecore certification is very costly. However, there is one excellent and FREE way to do the basic Sitecore certification for beginner’s track. You will get nicely formatted PPT slide desk, transcript for each slide, CSS, JS, cshtml files, videos, and exercise workbooks. Aprt from videos, rest all are available for download. You can complete this course with your pace but within 90 days from your registration date. What are you waiting for? 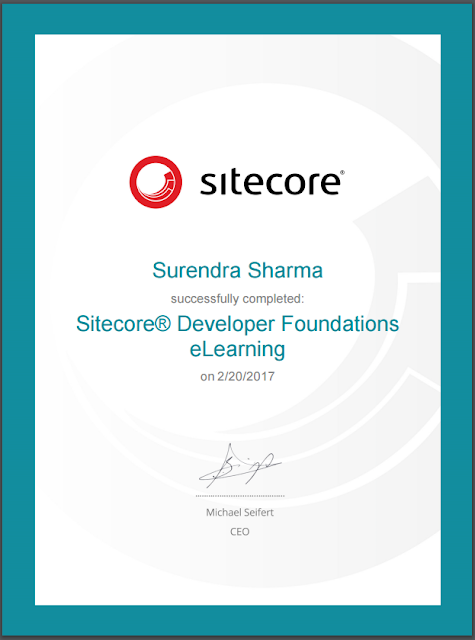 Grab your Sitecore Developer Foundations certificate now !!! I'm not able to register at https://elearning.sitecore.net, as it's not listing out my organization( Tried with other organization names as well) on clicking Organization. Please enter Asia in the search box of organization . its not free it requires a sitecore license.